Wed. September 19 – Share an FHE lesson or craft about The Family Proclamation. Sun. September 23 – Share your personal thoughts, testimony, or faith-promoting experiences with any aspect of the Proclamation. Wed. September 26 – Family Proclamation Photo Essay – pair photos of your family with different phrases from the Proclamation (as many as you choose). There are examples of photo essays from past celebrations here and here. Also, I invite you to give away a copy of Family: A Proclamation to the World to someone who maybe has never seen/read it before. Why? Because it’s awesome. And it’s true. Anytime we can help people to love and honor and promote family, it’s a good thing. I’m hoping that on the last day, Sept. 30, you can come share with us how that experience went. You can order them in brochure form (perfect for giving away) right here for FREE, even with shipping. So please hurry and order some copies and start giving them away because I want to hear all about it. Hooray. (And all kinds of other celebratory exclamations.) !!! You ready for this? I loved Proclamation week last year! I hadn’t heard of it before. I’m excited to see what you all do. You are awesome at sharing the love. Just saying. Thank you for that challenge. I just ordered 5, one for each member of our family, to give away, hopefully by Sept 30. I am so looking forward to this celebration! 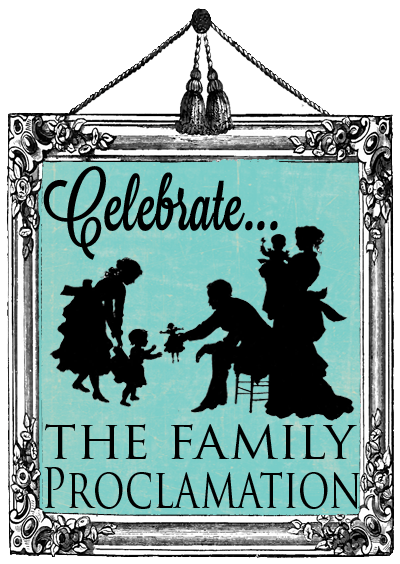 I love the idea of Family Proclamation week! Great idea! This is great! LOVE IT! There is so much good things to share with others, this really made my day!